Rosa Umbach was recently awarded the Chairperson’s Award for 2017 in recognition for her influence in the community and support of the agency’s mission and board. 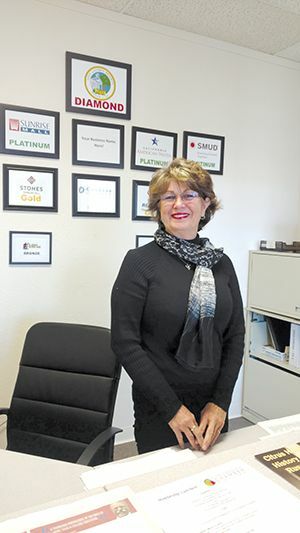 CITRUS HEIGHTS, CA (MPG) – Rosa Umbach chairs the Citrus Heights Chamber of Commerce’s Education Committee and also is a member of its board of directors. Rosa was recently awarded the Chairperson’s Award for 2017 by the Chamber’s immediate past chairman, Johnnise Downs, in recognition for her influence in the community and support of the agency’s mission and board. Umbach, a mother of four, has a long history of working with individuals with disabilities and the homeless. But giving back has always been a family affair. Q: What is your professional background? A: I retired from the State of California in 2009. I worked in Information Technology. When I retired I was one of their managers working with disaster recovery planning and risk managing for 150 state agencies. Q: How did you get involved with the chamber? A: It was actually my husband, Ken, who got me involved. When he retired from his work in public policy in 2003, he started Umbach Publishing & Consulting and became a member. I started joining him and when I retired in 2009 I got very active by going to the education committee meetings and supporting chamber events. Eventually I became vice chair of the committee under Cendrinne and now here I am. (Cendrinne DeMattei is now the chamber’s current executive director). Q: Tell us about the work of your committee. A: Our primary focus is to find out what students and teachers need across our area and that includes more than just supplies. If there are kids who need coats, I’ll go out and find coats on sale for kids in need. We survey our schools each year and we ask them for a list of their needs and we run the school supply drive in July and August. We do this in summer so that by the time the school year begins they have something to start with. We do one drive, but we distribute supplies, as well as any cash or gift cards twice a year, once in fall and again in the spring. Q: The committee also oversees the Job Readiness Program. Tell us more about that? A: This is a program for sophomore students. If they want to, they go through our business academy where they learn all of the facets of looking for a job and keeping a job, such as communications, resume preparation skills, work ethics and interviewing. It’s a very successful part of our programing. When I took over as chair, we held the Job Readiness trainings once a year. Now we do it in fall and again in January because it has been so well-received. Q: You are an advocate for individuals living with disabilities. How did this work come to you? A: Yes. This work is very much a part of my heart. My mother’s sister, Aunt Ruth, was born with cerebral palsy. I began by first helping her at the facility where she was until she got her own apartment at age 60. I became the third generation of women in our family to care for her. I got to see up close how people living with disabilities were treated in the community and I wanted to be an advocate for them. She wanted to paint but she was not able to use her hands. So I helped have a helmet made for her that she used to paint with. When she was given an apartment, she was matched up with a young girl, Laura, as a roommate. I call her “Aunt Laura.” Aunt Ruth passed away in 2010. But today, I am Aunt Laura’s power of attorney. She became family. I have more people who are part of my family who aren’t blood related. Q: Where did that experience take you? A: When Aunt Ruth passed away, I wanted to continue working with individuals with disabilities. I learned about A Touch of Understanding. It is such an awesome group. They provide incredible trainings for youth to give them tools for developing compassion from those who are different from them. I trained and have worked as a volunteer workshop coordinator for ATOU since 2010. Q: Your spirit of giving back seems to be in your blood. Were your parents involved in volunteering? A: Yes. My mother was a volunteer paramedic and my dad was a volunteer firefighter, both for Sutter County. When they passed away, the fire department escorted their caskets. Q: Did you raise your children with the spirit of giving back? A: Absolutely. My late husband and I always talked about this with our kids when they were growing up. We used to take them to the mall every Christmas and each of them would get a name from the Christmas tree for needy children and we’d take them to shop for a present to give. Q: What other areas of volunteerism are you involved in? A: Ken and I were, and I guess I still am, very involved with rescuing cats. It started with the recession, when a lot of people were losing their homes to foreclosure and leaving their animals behind. Also, I support a local couple who distribute toiletry kits to the area homeless and often will pass out meals. Those toiletry items seem like a small thing, but believe me they make a difference.